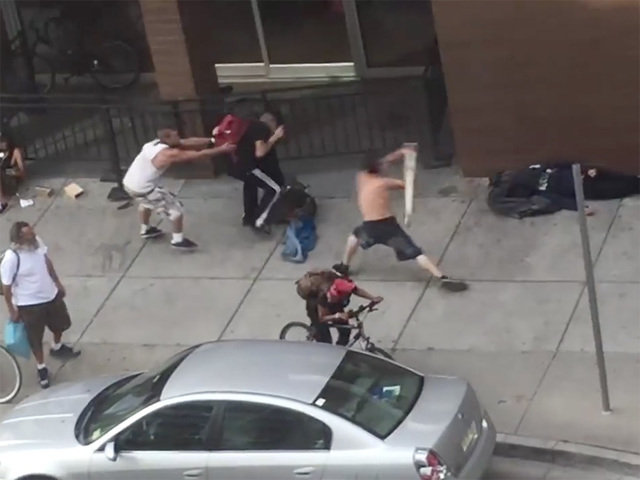 A disturbing video of a homeless man attacking others in broad daylight is calling into question what exactly the City of Denver is doing to protect residents and tourists alike at a local mall. "The 16th Street Mall is unpatrolled and people are getting hurt. This is why I am posting this. Nothing is being done. The leaders in our city keep saying they are going to do something. When?," said Caleb Bonham, a witness of the attack which took place late Wednesday afternoon. Footage of the attack comes just a couple of days after Denver Mayor Michael B. Hancock announced the 16th St. Mall would hire a private security firm as well as add more Denver Police Department officers to patrol the area . "We will not and I want to be very clear about this, will not tolerate those who have no other intention than to harass people along the mall, to commit violent threatening acts," said Mayor Hancock, during the announcement on Monday. The Downtown Denver Partnership will not release exact figures about the private security plan. President and CEO, Tami Door, could not say how many private officers will be hired or how much the effort will cost. She would only say the overall security plan will cost about $1 million. Denver is trying to deal with a problem the mayor called "urban travelers." At one point during the press conference he also referred to the issue as a "scourge of hoodlums." "We’re not talking about Denver’s homeless… we’re talking about groups of people hanging out in the mall area who we call urban travelers," said Mayor Hancock. The suspect in Wednesday's attack was arrested at around 6 p.m., after assaulting at least three victims "with some type of weapon" injuring two of them, said DPD spokesperson Doug Schepman. The suspect is still being booked and faces aggravated assault charges, Schepman said. A Downtown Security Action Plan was completed in January. It includes more than 240 suggestions called actions items. The ideas range from improved lighting to better communication with area business owners. In April, the Downtown Denver Partnership and Downtown Denver Business Improvement District requested proposals for a private security contractor. 12 firms responded to the request. A decision on the security contract is expected in July. In the meantime, the Denver Police Department will begin adding more officers through its Walk the Beat program. Police will reevaluate their efforts in September.